The Shorties – My 2016 Short Story Awards! Somehow I neglected to do the “Shorties” awards last year. But here are the 2013 and 2014 editions if you want to see the past winners. This year, for the Third “Annual” edition, we retain George R.R. Martin’s Tyrion Lannister, brilliantly brought to life by actor Peter Dinklage in the HBO Series, Game of Thrones, as our spokesman, taking to heart his quotation below. “A mind needs books as a sword needs a whetstone if it is to keep its edge.” And… once again, as I did last year, I’ll stress that “shorties” is intended as a term of endearment not a politically incorrect disparaging remark about short people. 🙂 All the stories below may be found in the summary post for my 2016 Deal Me In Challenge. Really a toss up here, between Pyle and Thompson, but I’m going to have to go with Maurice Thompson. 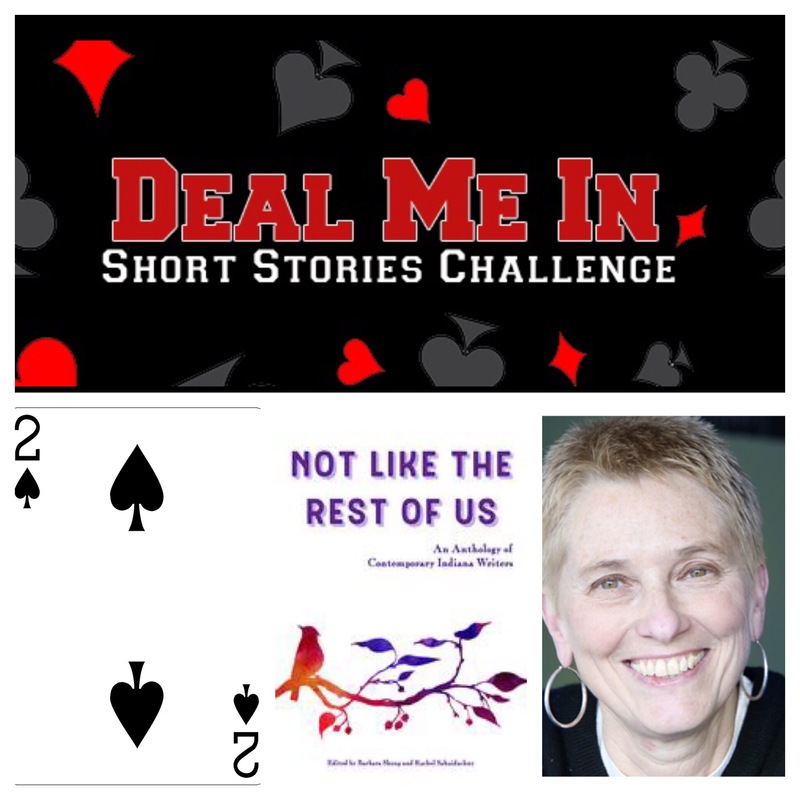 Both his stories in my Deal Me In deck were among my favorites of the year! At the risk of heading toward an Academy Award-like sweep, I’ll go with the title character, Alice, in Booth Tarkington’s The Beautiful Lady. Such purity of heart is rare – and refreshing. I did notice that there was a lack of memorable female characters in my Deal Me In stories this year. Of course, with a lot of non-fiction in the mix, there were fewer opportunities, but I’m going to keep a better eye out for them in 2017. I enjoyed all of these writers very much, but the Shortie goes to Tarkington. The clinching quotation (from The Beautiful Lady): “To fall in love must one behold a face? Yes; at thirty. At twenty, when one is something of a poet No: it is sufficient to see a grey pongee skirt! At fifty, when one is a philosopher No: it is enough to perceive a soul! I had done both; I had seen the skirt; I had perceived the soul.” Winner. So tough to decide, but since I’ve already “honored” Tarkington twice, I’m going to go with Maurice Thompson’s story, “The Pedagogue” – a classic Indiana “Frontier” story that sometimes reminded me of The Legend of Sleepy Hollow. Honorable mention to Martone, whose stories in the collection “Fort Wayne is Seventh on Hitler’s List” have all been enjoyable thus far. This year for Deal Me In (my 7th!) I’ve decided to try something a little new. I’ve decided to let fate decide, er, I mean let THE fates decide. You know, the three fates from Greek Mythology? Clotho, Lachesis & Atropos? (pictured below) In Plato’s Republic, Lachesis sings of “things that were,” Clothos of “the things that are,” and Atropos of “the things that are to be.” So I’ve roughly assigned some stories or essays that fit those categories. But that’s only three suits, right? I needed a fourth, and for some reason I recalled that the streets in the Indianapolis neighborhood I grew up in had literary names. (Hawthorne, Emerson, Riley, etc.) So I’m going to “take a stroll through the old neighborhood”and read things by the “author” street names in that neighborhood. How’s that? I’ve also included some more essays in my roster, making this a non-pure “short story” challenge. But the rules are flexible on that. 🙂 I’m repeating my tradition of making “deuces wild” to allow some ad hoc selections throughout the year. I will try to keep those in line with their suit, though. 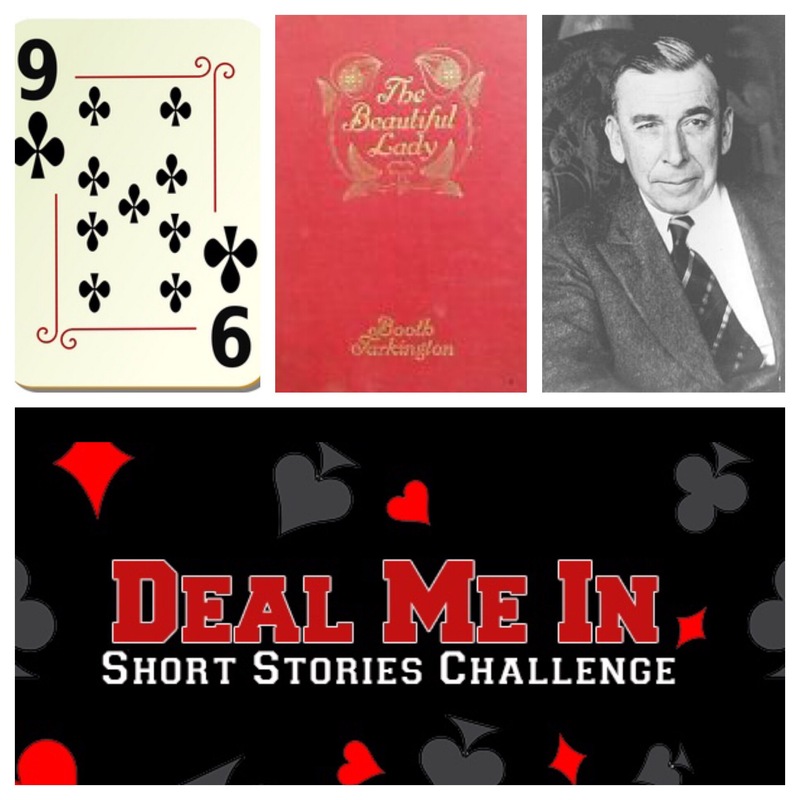 “It’s The Most Wonderful Day of the Year!” – Announcing the 7th Annual “DEAL ME IN” short story reading challenge. -Anthony Hopkins (portraying Dr. Robert Ford) in Westworld, season 1, episode 10. Yes, I know you’re being bombarded with posts about all sorts of reading challenges for the new year, and they all sound like a lot of fun. But here’s a unique challenge where your reading burden is relatively light AND where you still can experience a lot of different authors and genres. 2) if you don’t have a blog or website you may comment on any of my Deal Me In posts, sharing thoughts on your own story – or start one at WordPress or blogspot – it’s easy and free to create a basic blog. (The 52 stories themselves are totally up to you.) Before you get start reading, come up with a roster of fifty-two stories (you can use any source) and assign each one to a playing card in a standard deck of cards. It can be fun to use different suits for different types of stories, but that is optional. I’ve often included one wild card for each suit too, so I can maybe read a story I’ve heard about during the year, or read another by an author I’ve discovered through this challenge. Each “week,” (if you’re like me, you may occasionally fall a story or two behind – that’s okay) you draw a card at random from your deck and that is the story you will read. There are links to many of last year’s participants’ rosters in the comments to last year’s sign-up if you want to see some examples. I’ll be posting my own 2017 roster soon. My twists this year? 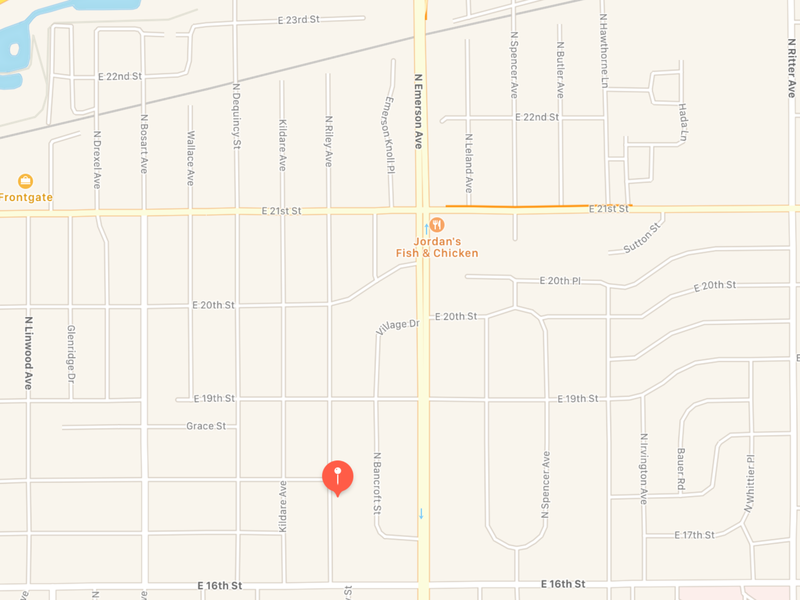 I’m actually including 13 essays this time around (inspired by “o” at the Behold the Stars blog) One of my suits will be stories by authors who the streets in the neighborhood I grew up in are named after (Irving, Hawthorne, Wallace, etc.) I think my other three suits will be loosely based on the three fates (Moirae) from Greek Mythology who, we are told in Plato’s “Republic” sing of “things that were, things that are, and things that will be.” Not sure how I’m going to manage that, but I have a few days left. Leave a comment below with your URL and I will link you on my home page, where I’ll eventually have a section in my sidebar for “2017 Deal Me In Participants.” This year, I think I’ll try to go back to a weekly wrap-up post, linking to other Deal Me In participants’ posts I’ve seen recently too. Late sign-ups are allowed and encouraged too. The Deal Me In “Euchre Deck Version”If you work for “one of those companies” where you only get paid twice a month on the 15th and 30th, e.g., use a euchre deck! Note: I’ve experimented with an accelerated euchre deck version for a couple readathons, especially the 24 in 48 readathon, where, instead of trying to read 24 hours out of 48, I try to read 24 short stories in 48 hours. Also pretty challenging. The Deal Me In “Full Moon Fever Version” – this would be the baby steps way to ease into the Deal Me In routine, basically reading just one story a month (who doesn’t have time for that?). Just use one suit or face cards only and you’re set. Seeing the full moon in the sky can also serve as a reminder – “hey, I need to read my next short story!” We only have twelve full moons in 2017, so maybe you can have a ‘discretionary read’ sometime during the year where you draw a thirteenth card. You can try the using the new moons, as well, or BOTH new and full moons. In the past, we’ve had a couple Deal Me In’ers have a full moon add-on in addition to their 52 stories. On December 11th, two-hundred years ago, Indiana became a state. The 19th state in the United States of America to be precise. 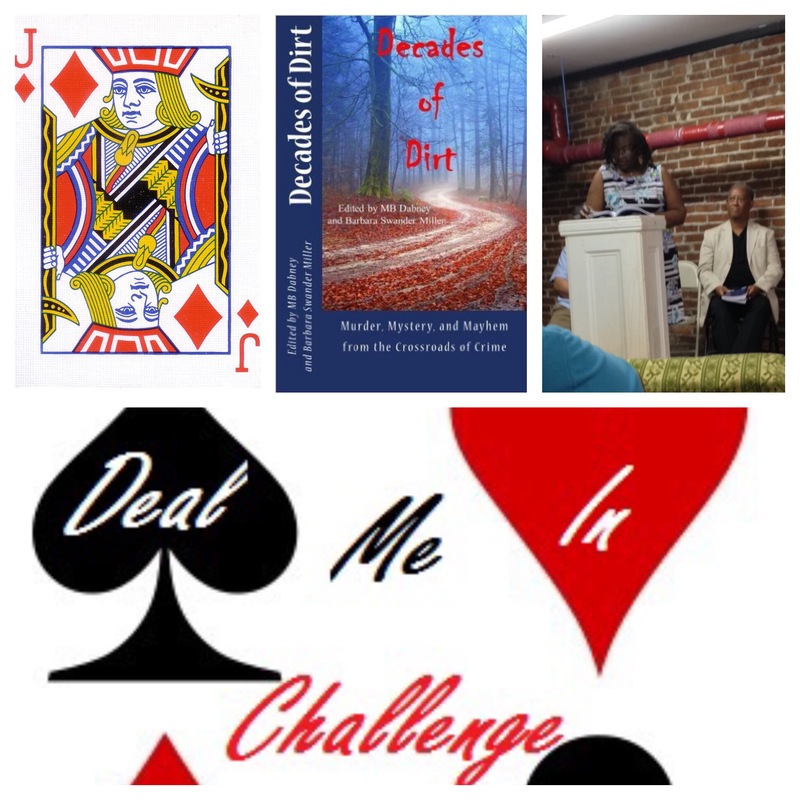 346 days ago, here at Bibliophilopolis we began a year-long celebration of the State’s Bicentennial year, retrofitting our annual “Deal Me In” short story reading challenge (What is Deal Me In??) to contain only stories with some Indiana connection. It’s been a long journey and, rather than spread out the final three posts of the rest of December (i.e. after Indiana’s actual birthday has passed), I thought I’d just do the last few early to get them posted closer to the exact date of Indiana’s birth. During the course of the year for this project, I read more than twenty authors for the first time, and several I know will become future favorites. My favorite suit was easily “Clubs” – the “legendary authors” suit, but each suit had its own merits and I did enjoy reading some short, non-fiction works for the first time in a Deal Me In challenge this year. So much so that I may include a suit of essays in my 2017 version. We’ll see. Well, thanks to all those who followed along this year, and especially those that commented on some of these 52 posts. If Deal Me IN was a new discovery for you this year, I hope you’ll consider doing the challenge in 2017. The official sign-up post will be on 12/21/2016. The Suit: For this year’s Deal Me IN, Spades is my suit for short Indiana-related non-fiction works. The Selection: “Working a Jigsaw” from my copy of the “Not Like the Rest of Us” anthology of poetry, fiction and non-fiction, which along with Deal Me “IN” 2016, is a fellow Legacy Project of the Indiana Bicentennial Commission. The Author: Barb Shoup, the director of the Indiana Writer’s Center in Indianapolis. A couple years back, I enjoyed her novel, “Looking for Jack Kerouac” but didn’t blog about it. My buddy Dale at the Mirror With Clouds blog did, though. What is Deal Me “IN” 2016? I’m glad you asked! Before the start of each year, I come up with a list of 52 stories to read and assign each of them to a playing card in a standard deck. Each week, I draw a card, and that is the story I read. By the end of the year (52 weeks), I’m done, and ready to start a fresh deck. (For a more detailed explanation of the Deal Me In challenge, see the sign up post. For a look at my deck of cards/storyroster click here.) Since 2016 is my home state’s bicentennial, in this year’s edition of my annual Deal Me In challenge, I’m reading only stories that have an Indiana “connection” of some kind. The 2016 iteration of Deal Me “IN” is also a “Legacy Project” officially endorsed by The Indiana Bicentennial Commission! In “Working a Jigsaw” Shoup describes a planned week-long personal writing retreat where she intends to get some serious work done without distractions. Describing items she’s packing for the trip (books, notebooks, computer, printer, paper, pens, etc) she then adds “As an afterthought, I brought along a puzzle.” It’s not just any puzzle though, it’s a jigsaw puzzle of a painting by Vermeer, she “impulse bought” when in Wales. 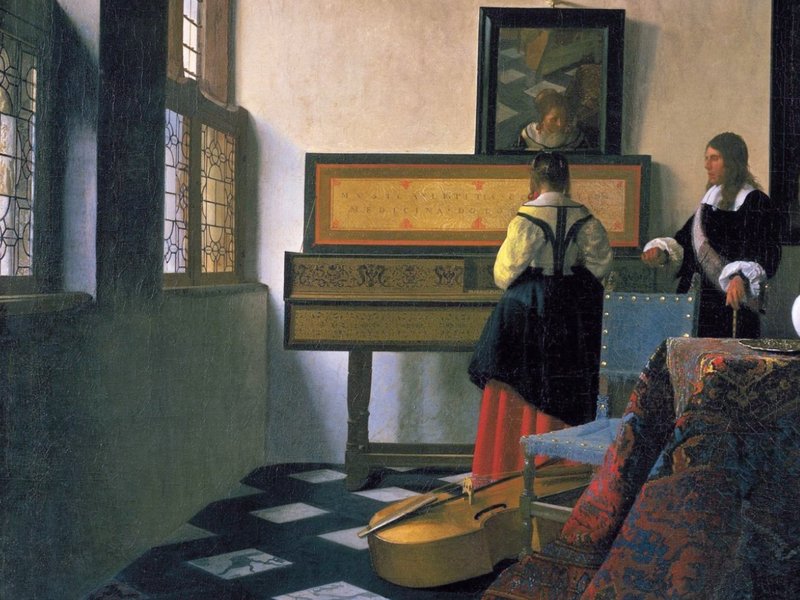 I looked up Vermeer after reading this story and, although I’m not certain, I think I may have found the painting that the puzzle in this story represents. ♫♫Personal Notes: Do you enjoy jigsaw puzzles? Did you do a lot of them as a kid, but don’t do them any more? I bet a lot of us fall into the latter description, myself included. Sort of. I remember several large puzzles we had when I was a kid that we liked to do over and over again. One was of a couple boys being given spoonfuls of castor oil by a woman while they were sitting among scattered green apple cores as a sign that they had over indulged. Another favorite was one of the presidents. It was unique because it was circular in shape, with small portraits of the presidents around the border and a seal of the United States in the middle. Of course, we were frequently vexed by lost or missing pieces. Well, with this post, my Deal Me “IN” 2016 project is complete. I’m a couple weeks ahead of schedule because I was desperately trying to finish on Indiana’s exact birthday (12/11) but I missed it by a day. Soon I’ll have a summary post with links to all the stories I’ve read this year. It’s been quite a fun challenge and I’ve “met” a lot of new authors that I’m sure I will see again over the years. I’m already starting to plan for the “7th Annual” Deal Me In Challenge in 2017. The official announcement/sign-up post will be on 12/21, the shortest day of the year. Thanks for reading! The Suit: For this year’s Deal Me IN, Diamonds is my suit for Stories by Contemporary Indiana Authors. The Selection: “Murder on Indiana Avenue” from my copy of the short story anthology “Decades of Dirt” – a production of the Speed City Chapter of Sisters of Crime. The Author: Andrea Smith (pictured above from a reading at Bookmamas Bookstore), an Indianapolis writer who was born in Chicago, and who I’ve read once before, in the “Hoosier Hoops and Hijinks” anthology. Eve and Gabriel Dawson are a jazz musician/singer couple from Chicago, in town (Indianapolis) to perform at the Stardust Theater. The club is run by a friend of theirs, Lester Sanders, and their appearance at his club is kind of a mutual favor for both parties. When they arrive, they awkwardly walk in on a confrontation between Lester and some unsavory types. Their friend subsequently waves it off as nothing, but sure enough, later in the evening their performance is interrupted when the police swarm the club investigating a murder, and Lester is their prime suspect! Eve and Gabe proceed to do some amateur detective work of their own, enlisting the aid of an attorney whose office is also in the Walker Building. A couple twists and turns later and they have their man. I’ve never been a big reader of mysteries, so don’t feel that well qualified to rate them. I do think it must be incredibly hard to write an effective one in just about 20 pages, but the stories I’ve read from the two anthologies produced by the Speed City (Indianapolis) Chapter of “Sisters of Crime” seem to be able to pull this off. The Suit: For this year’s Deal Me IN, Spades is my suit for short, Indiana-related non-fiction works. The Selection: “Educational Testing: Just Another Job” from collection of essays titled “Personal Indianapolis.” This is the fourth piece from this book that I’ve read for this year’s Deal Me “IN” challenge. The Author: David Hoppe –An Indianapolis writer who has labored for Indy’s “Alternative Weekly” Nuvo Magazine since 1998. I struggled with this piece, which was my least favorite of those that I’ve read thus far in Hoppe’s book, Personal Indianapolis. I have no children in school so perhaps lack a good vantage point of the issues the essay covered, but I have followed news stories about standardized tests for years, and have frequently been amazed at how big the time gap between testing and receiving results is. I also naively hadn’t realized that the standardized testing included a writing sample from the students (i.e. something that can’t be scored in an automated fashion). I had just been picturing a multiple choice, computer scored exam like many we used to have even way back when I was in school. Wait. It only means that if the rate is at the bottom of that scale. What about the 70 cent rate? At the top of the scale it would be $28 an hour, right? Shouldn’t it read something more like “scoring forty papers every sixty minutes might only earn him $12 an hour,” or even “That means he has to score forty papers every sixty minutes to make $12-$28 an hour”? My loyalty as a reader goes out the window pretty fast when I feel I’m being manipulated by partial truths, whether they are intentional or not. Overall, though, this piece and the DiMaggio article that inspired it, left me disappointed in “the system” once more and even glad I don’t have kids that are being “taught to pass tests” that people who often are not even educators themselves are scoring in an assembly line fashion. What about you? Any teachers out there reading this? What are your thoughts about standardized tests and their value? I’d love to hear more from the front lines on this issue. 10. Ernie Pyle – famous *Hoosier* war correspondent in World War Two. I’ve read several entries in his book “Final Chapter” and also bought another book of his (Home Front) and have ordered a biography on him too. I must like him. 9. Susan Wallace – wife of General Lew Wallace, who you may have heard of, she wrote the book “The Storied Sea,” which I read and enjoyed in hopes of attending a book club meeting but sadly couldn’t make it when the date came around. 6. Meredith Nicholson – a writer from “The Golden Age” of Indiana literature, I found his novel “The House of a Thousand Candles” a real delight. So much so that I bought and read a biography of him a month later. 5. Sarah Layden – Another local author who I’ve also had the good fortune of meeting a few times at local events. Her book “Trip Through Your Wires,” which I read back in February, is getting some great reviews. 3. James Baldwin – technically not totally new to me, as I had read a short story by him, but I finally got around to reading his famous “Go Tell it On the Mountain” and was quite impressed. 2. Lauren Ann Bolton – I read a story of hers from Butler University’s “Booth” literary journal and it (“The Man in Carnivorous Plants”) was one of the stories that made me think the most this year. Always a plus for me. Sorry, couldn’t find a pic in my cursory search. 1. Mark Haddon – I finally got around to his famous novel, “The Curious Incident of the Dog in the Night-time” last month for another book club. It led to one of my favorite discussions we’ve ever had with that group. The Selection: “Fort Wayne is Seventh on Hitler’s List” from the short story collection of the same name (with the subtitle: “Indiana Stories”). I own a paperback copy, and another of its contents, “Schliemann in Indianapolis” made an earlier appearance in this year’s Deal Me “IN” challenge. The Author: Michael Martone (his picture at left (that’s an Indiana flag shirt!) found at http://www.erinpringle.com/2014/07/2014-summer-library-series-four.html ). Last year I was quite impressed with “Winesburg, Indiana: A Fork River Anthology” which he edited, and I had heard of this volume through the grapevine so it found a place on my Deal Me “IN” roster. He was born in Fort Wayne, Indiana, and is currently a professor at the University of Alabama. Perhaps not, though. Other research indicates that Fort Wayne was potentially a prime target during World War II – due to industrial production, etc. – whether or not it was really on a list is a bit unclear. This “story” (it felt more to me like I was reading a prose poem) is about a city that was once on ‘high alert’ during wartime, and centers around the narrator’s grandfather who lived in those times. It also seems that the grandfather never quite fully exited the “war footing” mentality and even decades later would still see and feel things about the city in that context and through the lens of a slight paranoia. This gave the story a haunting quality. I enjoyed this piece less than the other one I read for Deal Me “IN,” but it was still quite good and I’d like to once again recommend the book Martone edited “Winesburg, Indiana.” Which is full of great, short vignettes about the people of a fictional Indiana town. Have you read anything by Michael Martone? What did you think of him? What are some of your favorite literary depictions of the “Home Front” during the war? One I can think of is the excellent “Under the Apple Tree” by Indiana author Dan Wakefield. 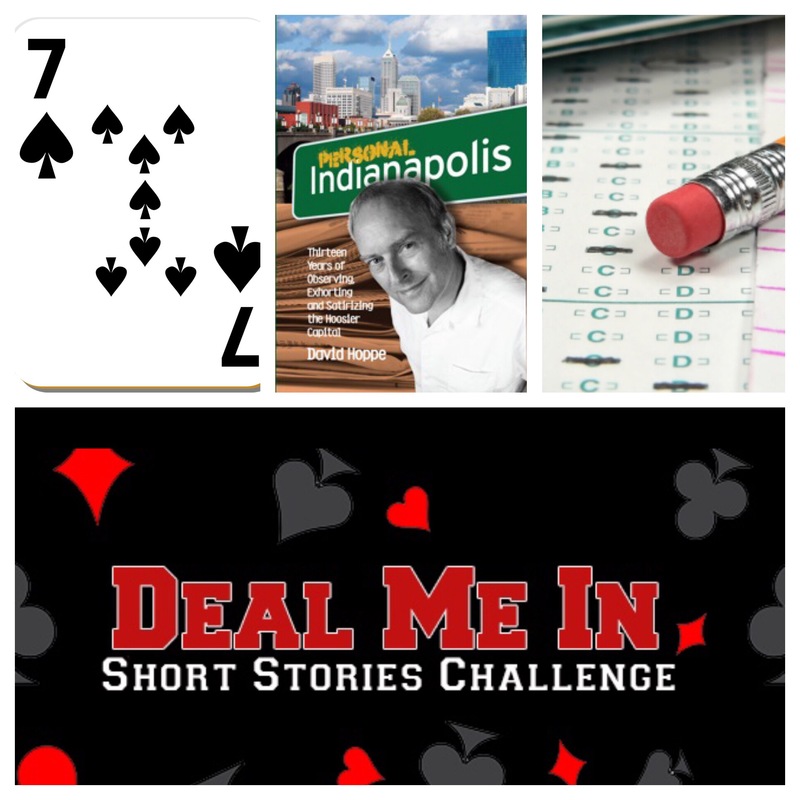 Deal Me In Bonus: Trivia question: Which iconic 1968 cinematic space traveler hailed from Fort Wayne, Indiana? The Author: Booth Tarkington of Indianapolis. One of the standard bearers of The Golden Age of Indiana Literature. He also won the Pulitzer Prize. Twice. What is Deal Me “IN” 2016? I’m glad you asked! Before the start of each year, I come up with a list of 52 stories to read and assign each of them to a playing card in a standard deck. Each week, I draw a card, and that is the story I read. By the end of the year (52 weeks), I’m done, and ready to start a fresh deck. (For a more detailed explanation of the Deal Me In challenge, see the sign up post. For a look at my deck of cards/storyroster click here.) Since 2016 is my home state’s bicentennial, in this year’s edition of my annual Deal Me In challenge, I’m reading only stories that have an Indiana “connection” of some kind. Deal Me “IN” is also now officially endorsed as a “Legacy Project” by The Indiana Bicentennial Commission. Just the quotation above should be enough to let you know what kind of story this will be, but I will drone on a little more about it… The narrator of the story is a man of twenty-four who is down on his luck in Paris. He has a half-brother who is seemingly a villain. He had a “full” brother who is now dead and whose two children the narrator tries his best to support and pay for their schooling at a nunnery. The beginning of the story finds him so penniless (franc-less?) that he has accepted a humiliating job for the term of a week. The job is to be a living advertisement for a theater and consists of him having to shave his head bald, allowing an advertisement to be painted on the top of his head, then to sit at the venue with his eyes pointing to his lap so passersby will see the ad and perhaps be curious enough to buy a ticket. He hates it. You probably would too. The narrator doesn’t see the lady during this “encounter” but perhaps will again during his next “job.” For my part, I loved this story. It was a bit predictable in its plot twists, which honestly stretched credibility to its seams, and also in its saccharine sweetness, which makes my admission of liking it something of a guilty pleasure, I suppose. It made me think of times in my own life where things weren’t going as I hoped or maybe when I was “ashamed” of a current employment or living status, and doesn’t it always seem to work out that you run into people you haven’t seen in a long time when you’re looking – or at – your worst? I believe Tarkington captures this phenomenon nearly perfectly in this story, which is one of my favorites of Deal Me “IN” this year. What have you read by Tarkington? The Magnificent Ambersons? Alice Adams? Some of his shorter works? I’d love to hear about your encounters with this author.